COVRI FONT SIZE CHANGE WEB PART for SharePoint gives its users flexibility to change font size on a click which otherwise is only possible through change in list or view settings. Using this web part the font size for the site can be increased or decreased as per user’s convenience however a third option of resetting to default font size is also provided. This is accomplished by clicking the appropriate webpart icons. If you find the text on a site too small for comfortable reading, you may not realize how easy it is to change this with COVRI FONT SIZE CHANGE WEB PART for SharePoint 2010. COVRI FONT SIZE CHANGE WEB PART for SharePoint gives its users flexibility to change font size on a click which otherwise is only possible through change in list or view settings. Using this web part the font size for the site can be increased or decreased as per user’s convenience however a third option of resetting to default font size is also provided. This is accomplished by clicking the appropriate webpart icons. If you find the text on a site too small for comfortable reading, you may not realize how easy it is to change this with COVRI FONT SIZE CHANGE WEB PART for SharePoint 2010. 2. Click on Add a web part. 4. The webpart will be added on the page which can be verified by the font size change icons on the page. 5. Click on the biggest icon to increase the Font size, with every click to this icon the font size will increase until the maximum size is reached. 6. When maximum font size is reached it will be grayed out. 7. Click on the smallest icon to decrease the font size, with every click to this icon the font size will decrease until the minimum size is reached. 8. When minimum font size is reached it will be grayed out. 9. Click the icon in the middle to reset the Font Size to default. 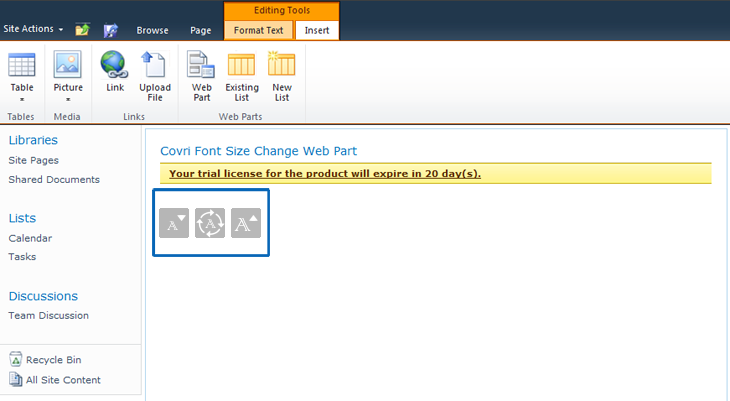 Font Size Change Web Part Version 1.0 released on 31st December 2012.